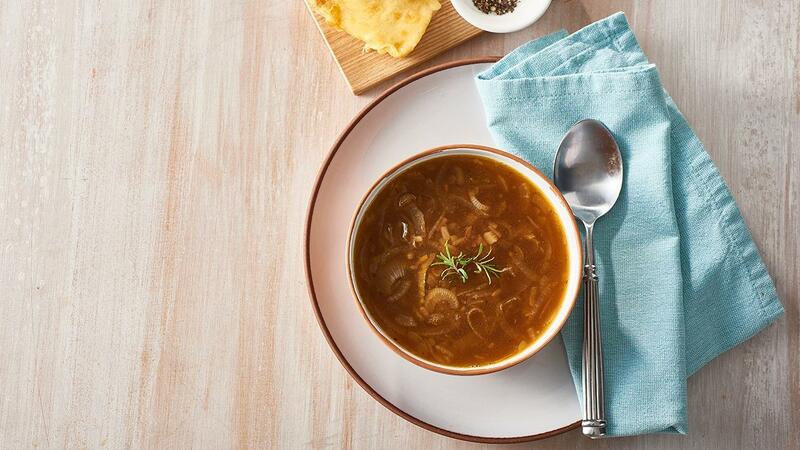 A hearty broth with rich caramelised onions, superb for cooler weather. Add grilled cheese toasties to really warm up your residents. Melt butter in a large saucepan and add onion. Cook over low heat for 20 minutes or until soft and slightly caramelized. Increase heat, add wine and reduce by half. Add water and CONTINENTAL Professional Gluten Free French Onion Soup Mix and bring to the boil, stirring continuously. Simmer for 10 minutes. Grill bread, top with cheese and continue to grill until melted and golden. Serve soup garnished with rosemary, accompanied with cheesy toast. The longer and slower you cook the onions the more sweetness and flavour the soup will have.